The book has been received with acclaim by a number of very important social scientists in India as well as in Europe and America. The Presentation helps greatly in a true understanding of the Hindu social psychology and institution. It is a comprehensive, systematic and integrated exposition of a very difficult subject. It is not only a pioneering attempt but has still remained unsurpassed. Pandharinth H. Prabhu studies at the University of Bombay and latter in the Universities of Michigan, Pennsylvania, and Columbia in U.S.A.; in Cambridge University in England; and in the Centre detrudes ET Recherches Psychotechniques in Paris, France at the Tata Institute of Social Science, Bombay; at Gujarat university where he was the first Director of its School of Psychology, Education and philosophy from 1958-67; as Fulbright visiting Professor at the Pennsylvania State University in 1961-62; and in the State University of New York at Oswego, N.Y. in 1969-71; as Leverhulme Vesting Professor of Psychology at the Australian national University in 1970; and as Senior professor of psychology and head of the Department of humanities and Social Sciences at the Indian Institute of Technology, Bombay (1972-75). He was Visiting Fellow at the Indian Institute of Advanced Studies, Simla (1975-77). 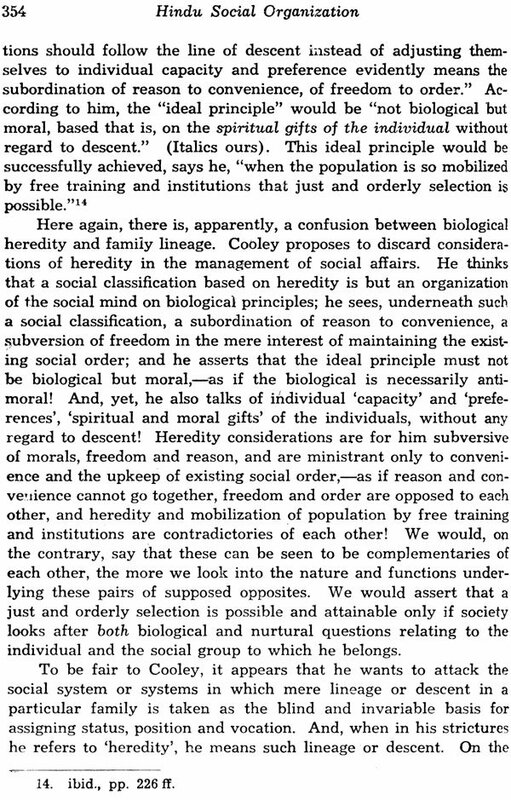 In 1956-57 he was senior research officer at the UNESCO Research Center for South and Southeast Asia. In 1963 he was elected President of the Section of Psychology and Education Sciences of the Indian Sciences Congress, Golden Jubilees Session. 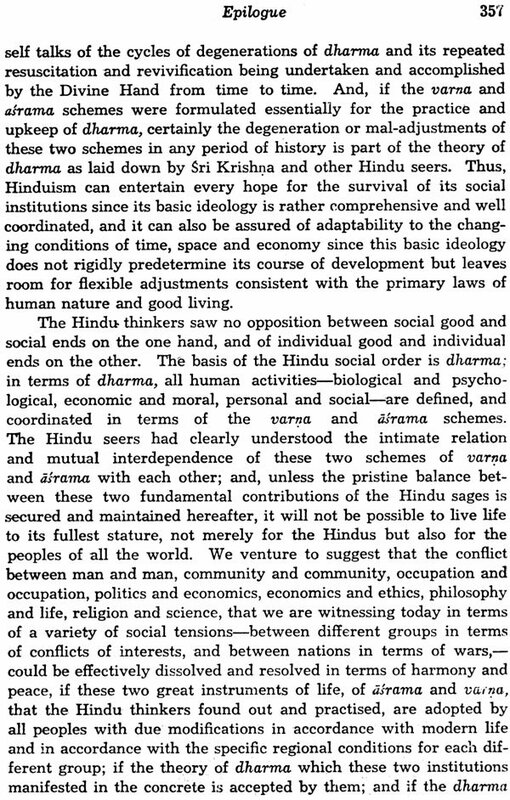 Dr. Prabhu’s book on “Hindu Social Institutions,” is, I believe, a serious account of Hindu social organization. It deals with the many topics of education, marriage, family, and the place of women in Hindu society, the systems of caste, with accurate learning and discrimination. To all those who are engaged in the task of revitalizing Hindu practices and renovating Hindu society, the book will be indispensable. We are today in the midst of a Hindu renaissance, waiting for new Smriti, will emphasize the essentials of the Hindu spirit and effect changes in its forms so as to make them more relevant to the changing conditions of India and the world. Forms which begin by being are soon diverted from their objects to which they owe their existence to new ones where they are no longer of any use, where they even become dangerous. The task of the wise reformer is to note the essential spirit of the institutions and reorient them so as to embody it better. 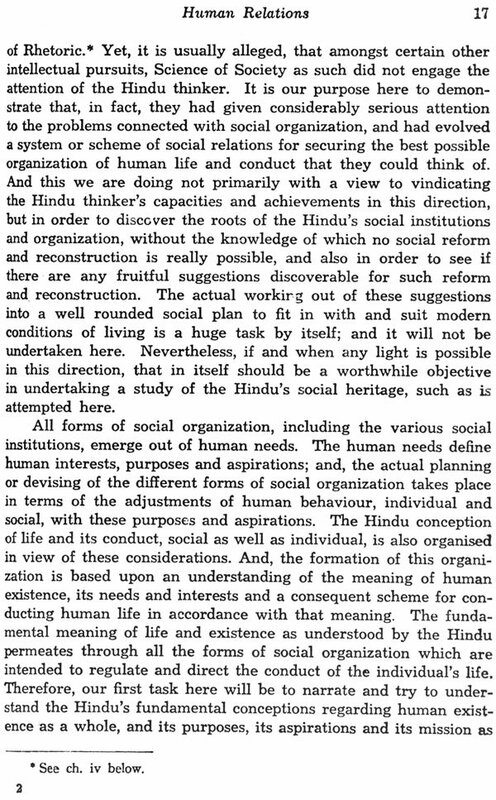 For such a task a true understanding of Hindu social psychology and institutions in essential and this book provides us with a key to it. The problem and purpose of these studies is explained in the Prologue. 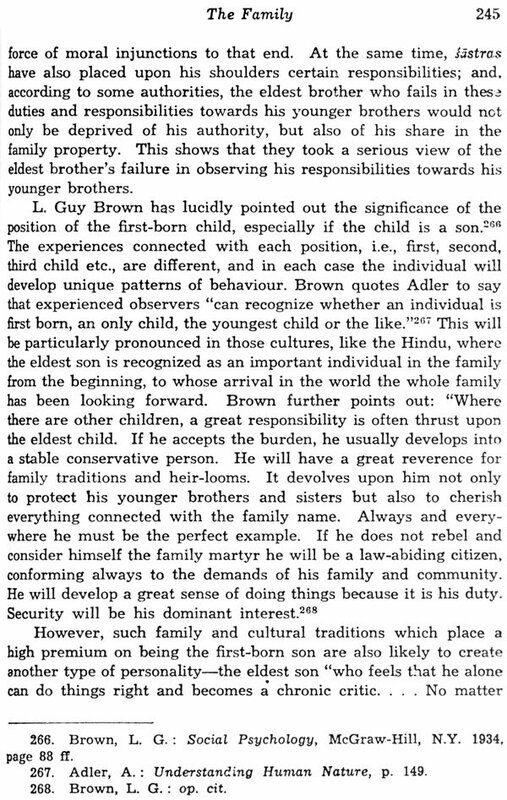 In brief, it is an institutional approach to the basic social psychology of the Hindus. A work of this kind is beset with numerous difficulties peculiar to it. 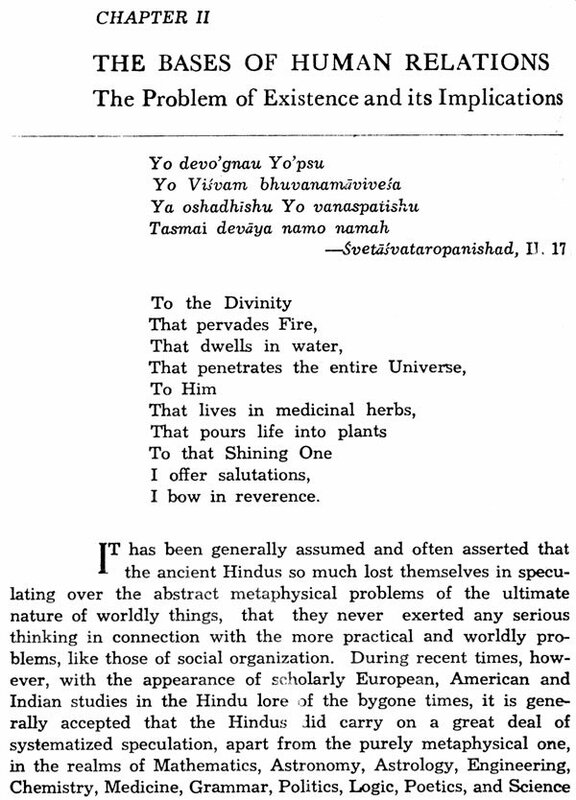 The task of separating and sifting the relevant and the pertinent from other material in the numerous Sanskrit texts, the difficulties in the why of correctly grasping the sense of the writers of the and interpreting the same in terms of contemporary expression without prejudice to the original import, and the proper assimilation and arrangement of the scattered and diffused material, are both time-consuming and labour- exacting. 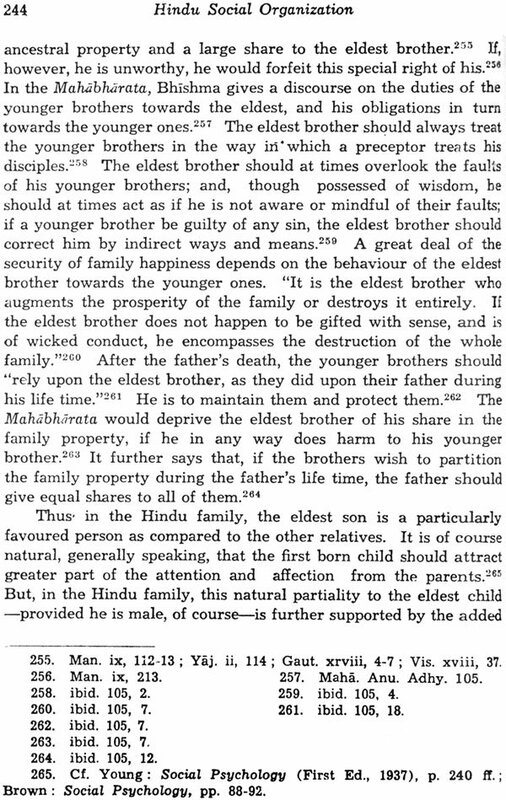 The author is quite conscious of the other shortcomings in this work which may be due to omission of certain aspects or points of view, other than those from which he has proceeded here, from which the Hindu social organization may also be considered in order to make a comprehensive treatise. 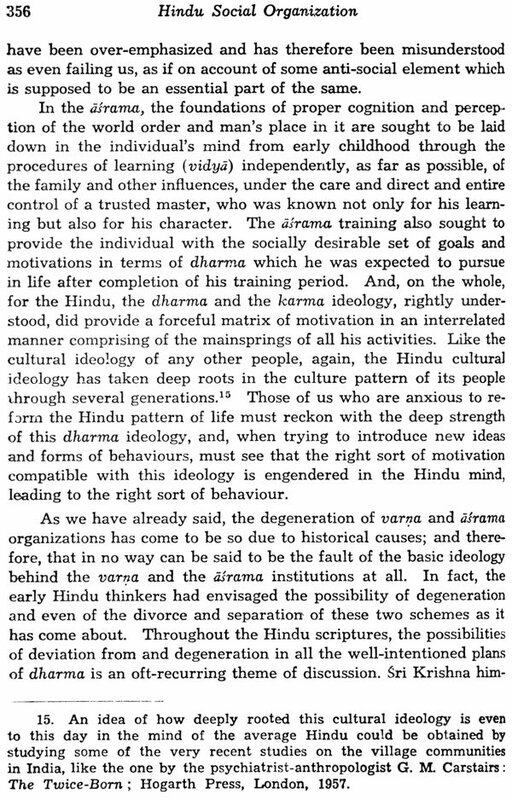 However, he has tried to make the best of the time and the resources at his disposal, and ventures to publish what may be regarded as the nucleus around which Theory of Social organization as conceived by the Hindu may be development and built up in time to come. 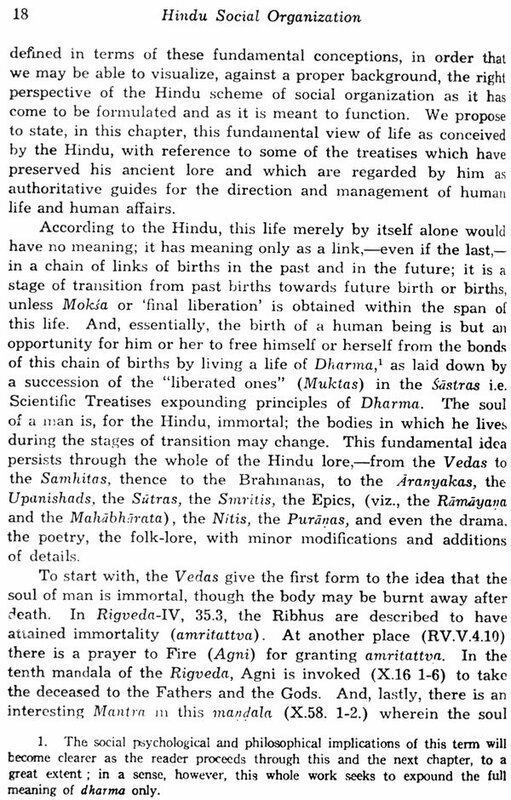 In the present work, I have often bracketed the original Sanskrit world or expression along with my translation of the same, so that the reader may judge for himself the appropriateness or relevance of my interpretation. 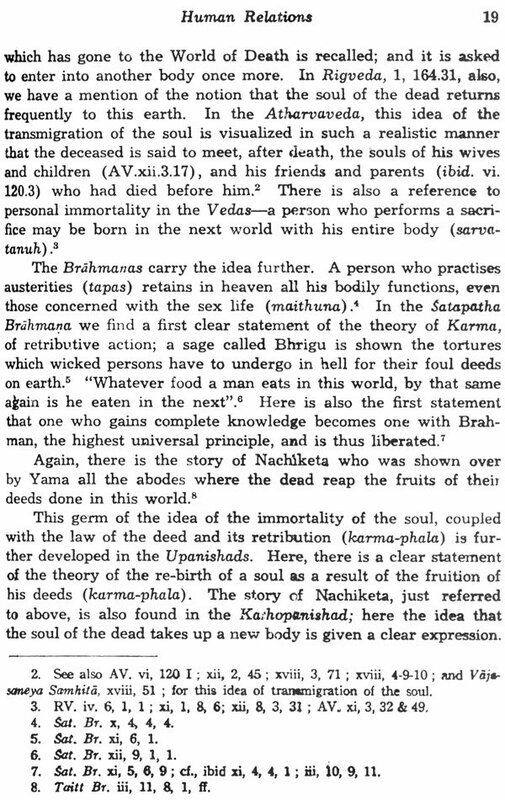 Also, in a few cases, where the full meaning and implications of a Sanskrit term could not be adequately expressed by the English translation into one word or phrase, I have retained the original terms, e.g., dharma, karma, guan & Though I have used available English translations of Sanskrit texts, I have generally sought to give my own translations. I have tried to avoid repetitions as best as I could; however, in a work connected with complex interpretation like the present one. Some repetitions become unavoidable, for the same material or statement may lend itself to be viewed from different points of view in different connections or contexts. It is a matter of great delight for me to acknowledge my intellectual and spiritual indebtedness to my teachers, two of whom I would specially like to mention here: Mr. K. S. Parulekar not only took personal interest in the progress of my students, but has also always favored me with his encouragement and counsel. It has always proved instructive and delightful for me to discuss with him various problems of human life and conduct. And I own a deep debt of gratitude to Dr. N. A. Thoothi for his personal guidance, encouragement, assurance and advice. My indebtedness to scriptural text and other writings is indicated specifically in the footnotes throughout the body of the work. Perhaps it could never become possible for an author to trace and identify the various sources from which his knowledge has been gradually derived and built up; and therefore my indebtedness to others must be much greater than I could possibly point out. However, I need hardly say that in regard to the views, interpretations and opinions expressed in the following pages and their shortcomings, the responsibility is entirely mine. I am deeply grateful to Dr. S. Radhakrishan for blessing this work with a Foreword, in the midst of and in spite of great pressure of work. The book is an attempt, probably the first one of its kind, to discover the essentials of Hindu social though and organization from a rather wide variety of sources and to coordinate them into a foundation frame-work for a systematic Indian sociology and social psychology. 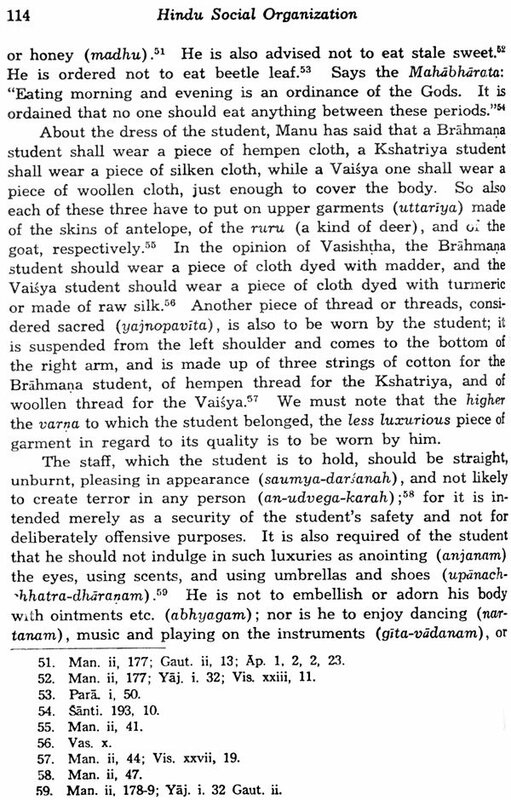 At the time that the book was first publication in 1940, the subject of Indian Sociology as such was not accorded any particular attention in our university, excepting in one or two in which serious teaching and studies in the subject had already commenced since the publication of the book, however, the subject has come into its own as a full and independent paper for study in the graduate and postgraduate classes in many Universities. 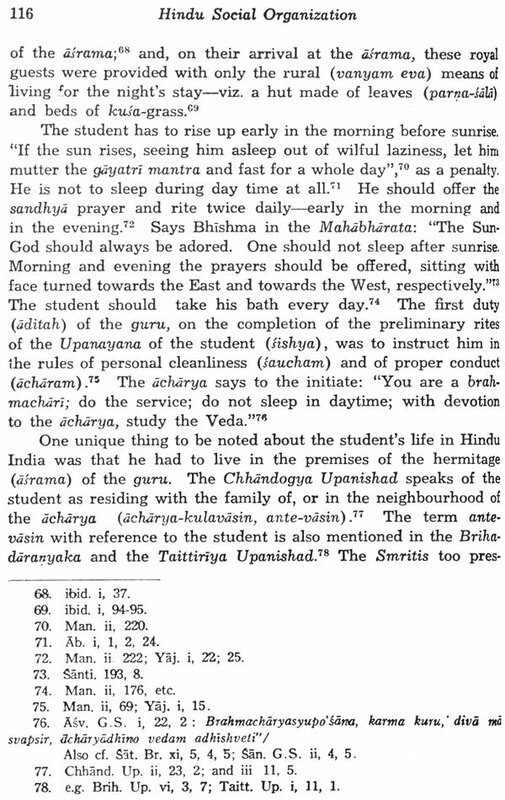 While the author does not wish to claim credit for the book for this change in outlook and emphasis in our university, the systematic presentation of Hindu social thought as attempted in the book has probably given some impetus to that outlook. At the same time this placed a certain responsibility on the shoulders of the author which prevented him from issuing a more reprint of the work, when the first edition went out of print some years back, without carefully revising the work. Such revision was delayed, however, from time revising the work. Such revision was delayed, however, from time to time, owing to the intervention of unforeseen circumstances. And now, even though has been able to bring out this revision, he is only too conscious of the shortcomings that still exist in the work. The subject is rather vast, and perhaps every chapter of the work could be expanded into a book, and some more aspects and issues also could be included in the treation. 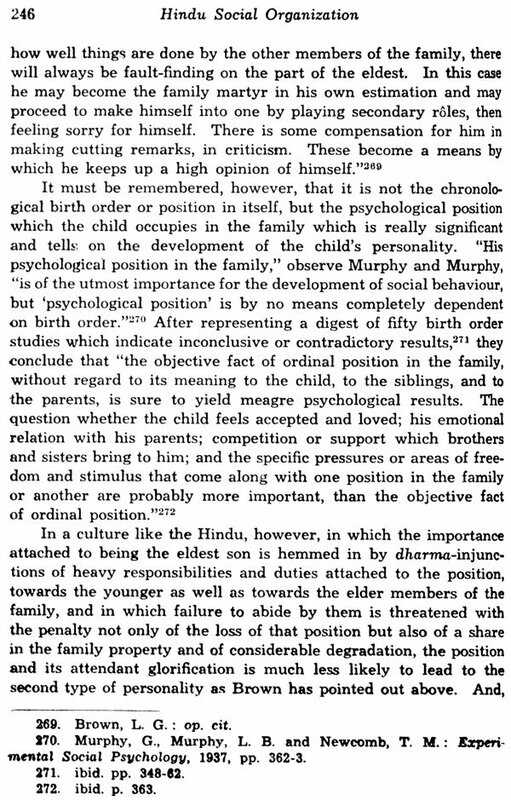 It is perhaps needless to say that our reference to an ‘Indian Sociology’ should be taken to imply that we believe in a number of ‘sociologies, one each for its country of its origin; what merely mean to imply is that social though in India has had its own peculiar lines of development which we have attempted to present in this work. To the critics and readers of the first edition of this book, I am deeply grateful for the keen interest they evinced in the work the appreciative comments they offered, in some spontaneously. 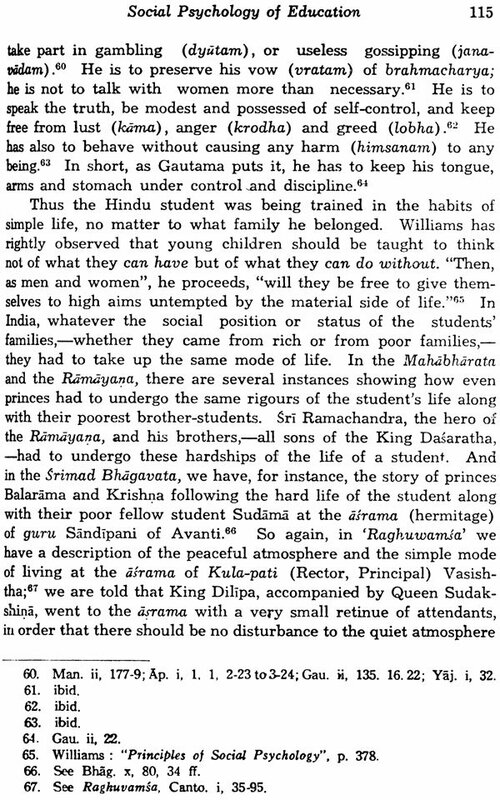 He is particularly grateful to Professor Ramechandra D. Remade, former Professor of Philosophy and Vico-Chancellor at Allahabad University for his kind and personal encouragement; to Professor Rao Bahadur K. V. Rangaswami Aiyengar, former Director of Sri Venkateswarea Oriental Institute, Tirupati and Marinara Professor of Indian Culture at Bananas Hindu University, and to the late Professor Edward. A. Ross, of Wisconsin University, U.S.A., each for carefully going through the work and sending in details his appraisal of the same. The author was struck by the reactions which were aroused on the publication of the first edition of the work in the two sections of scholars, the ‘orthodox’ and the ‘reformers’, Both of them have generally appreciated the work, in varying degrees; but some of the former group have tended to think that he has not been as warm and pronounced as he should have been in upholding Hindu cultural heritage and in denouncing the Western ways; while some from the latter group have felt that he has not been as strong as he should have been in denouncing some of the aspects of our “old’ social behavior and in pleading for fresh ideas and progress on his own part, however, the never consciously entertained the notice either of upholding or denouncing any ways, Indian or Western, but has tried to present as faithful a portrayal as possible of the Hindu social thought, psychology and organization. Advantage has been taken of the opportunity to bring out a third edition of the work and to make a few modifications in the material. The author is grateful to the readers of the book from various parts of the world who have conveyed their appreciation and comments on it to him. 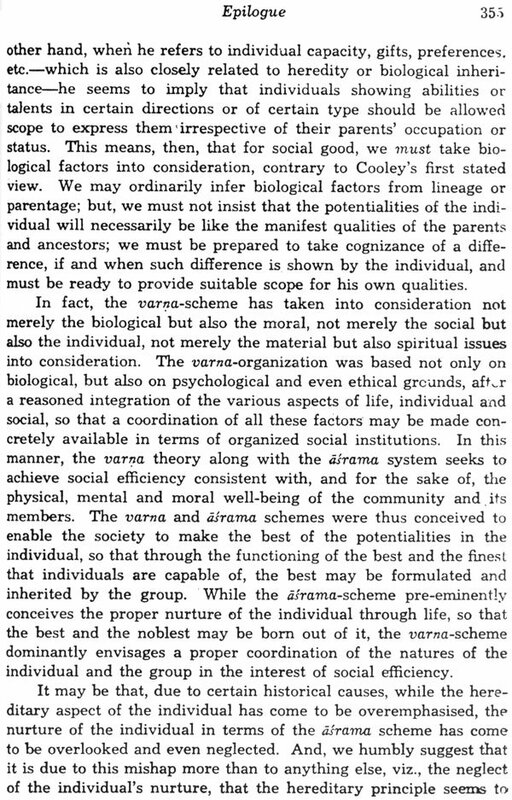 He is particularly beholden to the famous German social scientist, Leopold von Wiese, for honoring the work by writing a special article on in Kyklos; An International Review for Social Science (1955, Fase. 1, PP. 72-84). The present edition includes a few modifications, but mainly remains the same as before. In spite of the keen desire of the author to make a though revision, pressure of work has prevented him from undertaking the task. Errors discovered in the last edition have been corrected in this edition and a few additions have been made.